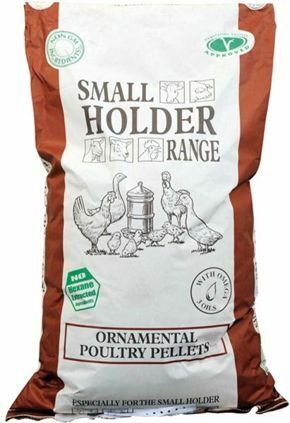 Ornamental Poultry Pellets is an ideal feed for all mature fowl. Also suitable for bantams, gamebirds, ornamental ducks, guinea fowl and pea fowl. Feed from 16-20 weeks onwards – suitable for ornamental birds including hens, bantams, ducks, ornamental gamebirds, peafowl and guinea fowl. Provide on an ad lib basis, they will require about 100-150g per hen per day, all year round. Introduce a new feed gradually over 7 to 10 days to help a smooth change over. This feed should be fed with ad lib fresh water and grit should be made available at all times.